Florence is a wonderful city, in fact it doesn’t requires a lot of work to fall in love with it. This Italian city is a living museum, where every street, alley, and building is full of history. The undisputed charm of the city of Florence comes not only from all the works of art you can see in every street, but also from the imperceptible hidden details, elements that can escape the eye at first glance. 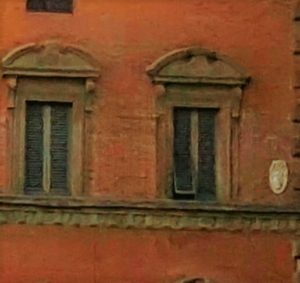 On the corner between Piazza Santissima Annunziata and Via dei Servi there is the Palazzo Grifoni (more known as Palazzo Budini-Gattai), which is a red brick palace. When you observe the palace from the square you might notice that on the facade of this building there is a particular window that is always open. One of the most less known Florentine legends relates that the Grifoni family lived in this building for centuries and it is said that toward the end of the sixth century, one of the Grifoni sons went off to war (which was not something uncommon at the time) and was so forced to leave her beloved wife. The beautiful lady ran to the window to greet him one last time and to watch him leaving. The legend tells us that the wife spent all of her time sitting nearby the window, hoping to see her husband again. The love of her life never returned home, and when she died, the window was shut. Some say that the neighbors of the two lovers were so touched by the profound love story that they decided to reopen the window. Other people say that when the window was closed, objects inside the room began to fly and furniture began to shake. As a servant reopened the window, everything returned normal. This makes us understand that this woman’s love is still there and her spirit still waits for her husband’s return and will probably wait forever. No one knows the woman’s name and no one will ever know which one of these two stories is true. 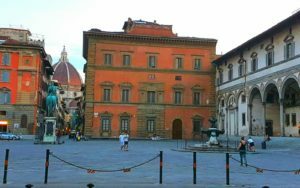 For more stories and legends about Florence, do not miss our history of Florence tours!